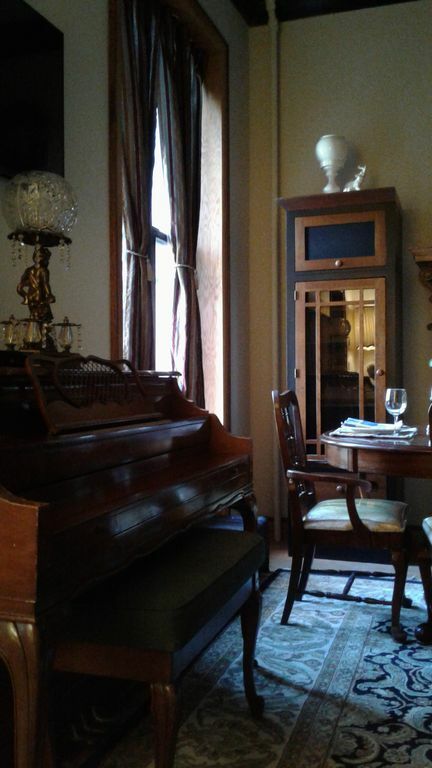 Newly-renovated, furnished, parlor floor apartment in historic Harlem brownstone. Master BR with 1 king-size bed, second BR w/full-size bed; living and dining area. Complete kitchen; internet and WiFi; one full bath. Within walking distance of express and local subways, buses and Harlem landmarks; 20 minutes from midtown Manhattan. Ideal for a mature couple seeking gracious living in an environment that combines the grace notes of a by-gone era with the comfort of modern conveniences. No stairs once you enter the building. This unit sleeps three people and is ideal for adults. For parties of four to six people, specifically families with children, please see our sister listing, Harlem Comfort, at listing number 484350. This listing is relatively new and we have only had two guests here. For more reviews, see listing number 484350. I was born and raised in NYC and have lived here almost my entire life. My dad's old office was literally right next door to the world-famous Apollo Theatre, so my love affair with Harlem began early. I love the diversity and excitement of NYC! I think it is one of the best places in the world to live, especially if you cannot afford to travel. There are so many different cultures on display in NYC. And Harlem is in the midst of a second (third? fourth? twelfth?) renaissance which makes every day an adventure. Since I've lived in this neighborhood, I don't think I've ever been bored a day in my life. The patterned tile floor of the vestibule, the spectacular woodwork which distinguishes the hallway and staircase; the fireplace with its pillars and tile work; the bay windows in the master bedroom - a brownstone is more than a building; it is a historical snapshot, a beautiful example of the elegance of a bygone era. This property is a living, vibrant museum. We manage and maintain it with a great deal of love. While I would never want to be bored, I also appreciate peace and serenity. The stately beauty of this building has a very calming effect on its residents which makes it very easy to relax after an exciting day of life in the big city. 1 full bathroom; completely renovated up to code with new fixtures. A spacious apartment, located in a quiet neighbourhood, and furnished with old-world charm. What really made our stay memorable was the thoughtful owner, Carolann. From airport transfer to a well-stocked pantry, she had provided everything a guest might need. Our flight was late but she was there to welcome us. We came as strangers and left as friends. We really enjoyed having you. Thanks for staying with us. And let's keep in touch with the recipes! Rates are non-negotiable and will not be lowered. If you are unwilling to pay them, please do not contact us. We do not give full or partial refunds for late arrivals or early departures under any circumstances. We cannot accommodate smokers. We appreciate your interest and are sorry to lose your business, but please do not contact us if you smoke. Entrance and common areas of this building are under 24-hour camera surveillance. Not suitable for children or singles. For short-term stay options and reviews, please see our sister property, Harlem Comfort, under listing number 484350.